Demolition worker Henry Aguilar stopped short when he saw cracked floor tile glued to the underside of a carpet he was tearing out of an office in downtown Boston. They were brown and old, signs that they might contain asbestos, a potentially deadly health hazard. The Skinner Demolition employee said he told his supervisor about the tile on the site in September, but was urged not to worry and keep on working. Aguilar did. He said he also placed some of the tile into a plastic bag for testing, at the request of The Eye and WBUR. Analysis at a state-accredited lab, ProScience Analytical Services, showed that the tile contained asbestos at levels requiring workers to wear specialized breathing masks to filter out cancer-causing asbestos dust. Yet the Guatemalan immigrant said he wore only a paper mask — protection not designed to keep out dust fibers hundreds of times finer than a strand of hair. "I wish they told me about it and someone moved it before I did the work," said Aguilar, 32, of Central Falls, Rhode Island. He said he was not trained to remove asbestos. Two of Aguilar’s fellow workers say they saw him complain to the supervisor. A lawyer for Skinner’s parent company said it is looking into Aguilar’s allegations about the downtown Boston worksite. Asbestos embedded in old buildings is creating a new wave of danger for laborers as renovation work soars -- even as the use of the carcinogenic mineral in new construction has been sharply curbed. Regulators found more than 300 asbestos safety violations resulting in fines in Massachusetts in five years ending in June 2016, the majority of them on job sites, state data show. Workers are routinely confronting asbestos woven decades ago into ceilings and floor tiles, blown into walls, or wrapped around boilers and heating pipes as insulation or fire retardant. 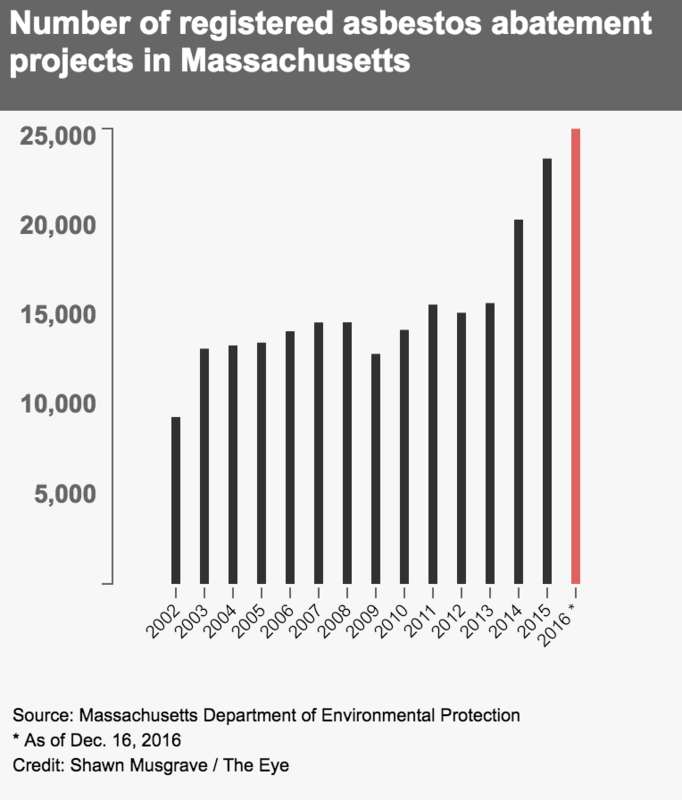 Registered asbestos removal projects in Massachusetts hit an all-time high in 2015 of 23,756, up more than 50 percent in five years. Many federal and state regulations are designed to protect the 3,400 people licensed to work in asbestos removal, as well as thousands of others like Aguilar who work in demolition. But an analysis by The Eye and WBUR of five years of enforcement cases -- as well as interviews with company owners, government officials, asbestos experts, union leaders and academics -- point to big gaps between the mandated safety standards and what happens on the ground. Until monitoring began increasing last year, the total number of onsite inspections by the state agencies responsible for asbestos safety was dropping as abatement and demolition projects were rising, increasing the chances that violations were missed. The state Department of Environmental Protection performed 527 inspections in the fiscal year ending in June 2015, less than half the number of 2012. The number of fines issued by state agencies for safety violations decreased during that four-year period, and didn’t always prevent recurrences. The maximum fine by the state Department of Labor Standards for first-time violations is $2,500. The state environmental department’s fines are typically higher, but the agency often reduces or suspends them. The Eye found 26 repeat offenders among the companies violating safety regulations in the last five years. It’s impossible to say how many of the hundreds of workers exposed in recent years may develop asbestos-related conditions, as it typically takes 10 to 40 years after exposure for disease to develop. But research in Britain has shown that asbestos removers are twice as likely to die from diseases linked to the mineral than those who worked with it in manufacturing. Despite curbed use, at least 4,000 people died from asbestos-related diseases in the U.S. in 2014, according to the latest data. In interviews, workers in Massachusetts say safety lapses are widespread, including inadequate respiratory protection, substandard hazardous-material suits, no curtains to contain dust, and failure by employers to provides shower facilities or places to change before leaving a site to prevent tracking dust home to families. A review of state records shows the places where violations occur range from residences to schools and office buildings. In April, one company was fined for failing to provide decontamination areas for at least three workers at an Andover home. In July, a state inspector found three workers weren’t wearing any breathing apparatus when removing ceiling tiles that contained asbestos at David Prouty High School in Spencer. The company overseeing the work, Ludlow-based Compass Restoration Services, was issued a $4,500 fine. Fran Mason, a Compass spokesman, said the company always provides adequate safety. In the case at issue, he said some workers took off their masks near the end of the abatement job. That same July, the Peabody firm National Abatement Inc. received its third state fine for workplace violations in three years. In one case, inspectors found four workers removing asbestos with no personal protection at all. The state said the company has paid $9,200 related to the first two fines, and is on a payment plan for an additional $10,000 fine. National Abatement did not return calls for comment. Alan Aulson, president of an asbestos abatement firm in Methuen, says there’s a “tremendous amount” of safety rule-breaking across the industry. Jobs often go to low bidders, who operate on slim margins and can cut costs by skipping safety steps, he said. Since many asbestos removers and demolition workers arrived in the U.S. illegally from countries including Guatemala, Ecuador, Honduras and El Salvador, they fear deportation if they complain, according to labor rights advocates and union officials. The workers say if they raise safety concerns, there is one sure result in the close-knit industry: “You don’t get any more work,’’ said a licensed asbestos worker in Lawrence, who asked not to be named to protect his job. Reports of illness from asbestos date back to ancient Greece, where it was used in textiles. But health concerns took a backseat in the 20th century, when the mineral became ubiquitous in construction because of its strength and heat resistance. By the 1980s, research linking it to cancer spawned litigation by ill workers that had been exposed, leading to billions of dollars in corporate liabilities. Today, court-ordered trust funds set up by the manufacturers are still paying damage claims. The U.S. never enacted a total ban on asbestos, as 58 other countries have done. Its use here is still permitted in products, including roof coatings and floor tiles. The most serious disease linked to asbestos is mesothelioma, an incurable cancer. Exposure also can cause lung cancer and asbestosis, marked by permanent scarring of the lungs. “It’s an awful cancer to have,’’ said Mike Dennen, 63, a former construction and textile worker diagnosed with mesothelioma four years ago. He said he spent about nine years removing asbestos in buildings. Now recovering from his sixth round of chemotherapy, Dennen has deep scars on his back and side from two cancer surgeries. In both, his body cavity was left open so doctors could wash it out with heated chemotherapy drugs. He said he suspects he was most exposed to the fibers during six months spent tearing insulation off basement pipes without adequate protection at a Martha’s Vineyard hotel in the 1980s. "We would touch the pipe insulation and this white dust like baby powder would come off," said Dennen, who lives in Sagamore, on Cape Cod. Now, "I have to gasp for breath." Asbestos removal workers say getting sick is always on their mind. Jose Flores, a native of El Salvador, said he worked for 12 years under worrying conditions for Air Safe, an abatement firm in Littleton. He worked there until 2013. Flores said Air Safe didn’t outfit him with the more protective types of respirators that he believed some jobs warranted. He said he would often have to ride home in the company van, without a mask, sitting atop black garbage bags filled with the day’s asbestos-laden debris. The bags would invariably tear and release dust, according to Flores. "Even though they are double-bagged, they always break," he said. Flores recently saw a specialist who told him he did not show signs of asbestos-related illness. However, Flores said he still worries, given the years that can pass before those who are exposed take ill.
David Walsh, co-owner of Air Safe, said he stands by his company’s good safety record. In 2012, he said Flores came to him concerned about asbestos exposure in the van trips. He said he issued a memo telling workers they were not allowed to travel in the cargo area of Air Safe vans. He provided a copy of the memo, which urged workers to come to management if they encountered any safety hazards. Do Penalties For Safety Violations Serve As Deterrents? Available data on regulatory oversight of asbestos in Massachusetts workplaces present a mixed picture of effectiveness. The federal Occupational Safety and Health Administration, which typically acts on complaints or reports of injuries on the job, has been relatively inactive compared to state agencies. 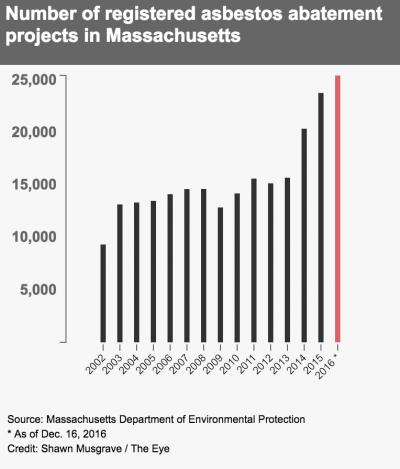 It found only one asbestos-related violation in Massachusetts in the 12 months through September 2016, down from nine violations three years earlier. State agencies say their asbestos-safety monitoring is up in the last 18 months. The Department of Environmental Protection conducted 1,199 inspections in its fiscal year ending in June 2016, more than twice the number of the year before. Gary Moran, deputy DEP commissioner, said the state prioritizes sites to inspect based on complaints, targeting bad actors. “We do think we adequately address public safety,” Moran said. The Department of Labor Standards said its inspections increased in calendar year 2015 and have continued rising, but said it couldn’t provide past data that were comparable. Asbestos-related fines issued by DLS max out at $2,500 per first violation or $5,000 for repeat offenses. While DEP fines can be issued at $25,000 a day per violation, they are often reduced or suspended. DEP fines initially amounted to more than $446,000 last year, but were later reduced by 60 percent. "Some employers budget-in fines as the price of doing business." "Some employers budget-in fines as the price of doing business,” said Cora Roelofs, an occupational health researcher who led a 2013 state study on asbestos-related deaths. “They assume there will be fines." In 2014, two companies owned by abatement-industry veteran Neal Cass were fined $188,725 by DEP for issues including improper asbestos removal at a Waltham home and Malden Catholic High School. All but $20,000 was suspended in part because of his inability to pay, state records show. He was also fined $600 by DLS that year for another asbestos-related violation in Acushnet. Inspection records show Cass was caught again several months later, this time for failing to properly remove asbestos shingles at a Somerville home. The state then demanded $60,725 of his suspended penalty, but government records show he hasn’t paid. Cass said he paid some of the original $20,000 fine, but can’t afford to pay more. Cass is still in asbestos-related work. State corporation records show he started Nealco Inspectional Services last year, which surveys properties for asbestos. If asbestos is found, his website recommends using a company called Clean Air Environmental. The answering machine at Nealco’s office phone says the caller has also reached Clean Air, which Cass said is owned by one of his former employees. Clean Air was fined $2,200 by DLS in June for not setting up decontamination chambers for workers at an Andover home and for having an expired contractor license. The DEP requires building owners to hire licensed inspectors to survey for asbestos at demolition sites before work begins. It’s unclear whether an inspection was done at 262 Washington St., the building where Aguilar worked for Skinner Demolition and said he found the suspicious tile. KS Partners, which owns and manages the property, did not respond to numerous calls. Eleven Skinner workers filed complaints with the Massachusetts Commission Against Discrimination earlier this year, a spokesman for MCAD confirmed. The complaints allege that the workers weren’t paid for all the hours they worked and weren’t given adequate asbestos protection, according to a union that represents the workers. Scott Connolly, an attorney for Skinner Services Inc., which runs the demolition company, said the allegations in the MCAD complaint were unfounded. Skinner "always put us to work where there’s lead and asbestos," said Ruben Pedrosa, 27, a Skinner worker who was with Aguilar when he discovered the suspicious tiles. If removers do get sick, it could be difficult for them to tap into trust funds established by manufacturers for asbestos liabilities, said Steven Kazan, founder of a law firm in Oakland that handles workers’ asbestos claims. He said workers would usually have to prove any asbestos came from a specific manufacturer and that it was never disturbed before they removed it. Aguilar said he is worried, "mostly for my family" because of the dust that may linger on him after work. “It’s contamination I’m bringing home,” he said. Then he turned around and went back to work.